An über successful New York City restaurateur and nightlife impresario wakes up one day and decides to take his entire empire vegan. This may sound like a scene out of a PETA fantasy video, but, in fact, this is precisely what transpired with Ravi DeRossi on January 1, 2016. If there is a secret to success with bars and restaurants, DeRossi has cracked the code for New York City. What began with one wine bar in the East Village has now expanded into fifteen hotspots across Manhattan and Brooklyn, including staples like The Bourgeois Pig, Cienfuegos, Mayahuel, Death and Company, and the newly relaunched Mother of Pearl. The painter and writer fell into the hospitality business with the economic downturn following September 11th. He opened a wine bar near his apartment with the intent to “just make enough to get by” and let someone else run the operation so he could continue as an artist. But with people waiting three or four hours just to get a seat, he found himself "sucked up into that world,” working and drinking nightly. Success led to opening bar after bar, place after place. He knew that he would one day open a vegan restaurant, with a focus on vegetables themselves, as opposed to fake meats, but did not know when the moment would present itself. King trumpet mushroom crudo infused with pineapple and jalapeño vodka at Mother of Pearl in Manhattan. 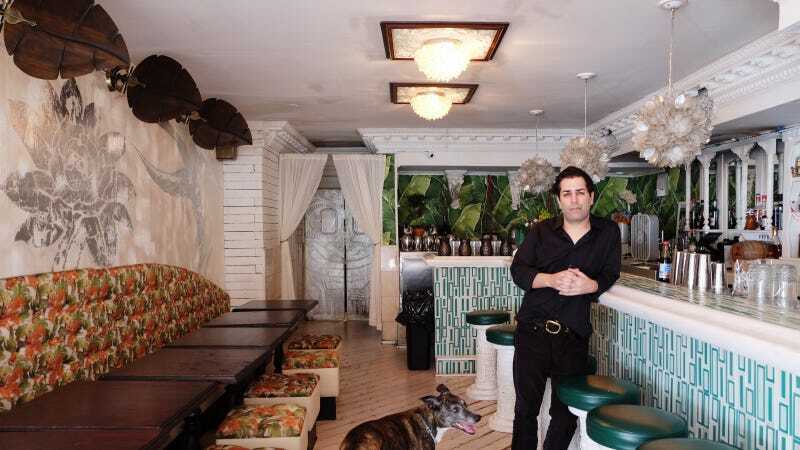 “I didn’t think it would do well; I didn’t think the world was ready for it.” So he waited strategically—until the fall of 2015 with the grand opening of Avant Garden in the East Village, which has seen wild success with critics and guests alike. DeRossi credits this to the fact that “the food is just as great as having a non-vegan meal,” on par with any top dining experience, designed by chefs with the palette of an omnivore, which he sees as more discerning. Vegetables are the star of the menu, and the best eighteen dishes were selected after tasting hundreds with Andrew D'Ambrosi, then-chef of his acclaimed Brooklyn seafood restaurant, Bergen Hill. D'Ambrosi turned DeRossi on to plant-based main staple mushrooms, which he “always thought were disgusting,” until trying a special preparation of hen of the wood mushrooms. "Could you do this with 20 different vegetables and no dairy products?” DeRossi asked. “I could try,” was the only answer he needed from the French-trained, butter and lard-prone chef. After two years of testing new, challenging recipe ideas as specials at Bergen Hill, the two had amassed an array of dishes that “you can eat and think you’re not eating vegan food, just good food.” That is the premise of the food at DeRossi’s "nightlife spots and dinner places," as he fondly refers to them. I don’t have to put my morals aside to be a businessman. I don’t have to put my ethics aside to do everything I want to do. "I don’t have to put my morals aside to be a businessman. I don’t have to put my ethics aside to do everything I want to do," he said. On January 1st, he called up Daphne Cheng, a talented young chef who has shown a mastery of vegetables and developed a reputation as the plant-based event hostess in New York and beyond. They share a similar aesthetic and he tapped her to be the Executive Chef overseeing this transition. "He called me on New Year’s Day and told me he’s doing this. It was the best news I ever ever heard,” Cheng exclaimed. She believes that DeRossi is in a position to make a massive difference because he is well known and has restaurants and bars that are longtime favorites. “It is such a big risk, but such a wonderful thing—and the response has been really great so far." For the February vegan relaunch of his Polynesian restaurant and cocktail bar, Mother of Pearl, she created a mushroom sous vide that has quickly become a favorite. The two are also collaborating on the transition of Cienfuegos, a rum cocktail bar and Cuban small plate restaurant, and Ladybird, a vegan wine and tapas bar that will replace The Bourgeois Pig—which is “so far from vegan right now,” says Cheng. She is excited by the opportunity to create menus for each location’s fun personality and unique theme. “It’s an ideal situation and something I am lucky to be a part of." DeRossi’s big upcoming project is the Avant Garden complex on McKarren Park in Williamsburg, which will feature four separate businesses in one large space later this year. The Bistro is a more casual, simple version of the Manhattan restaurant with indoor/outdoor seating and a long bar with full cocktail program. The Butcher is a deli or bodega-concept with plant-based meats and cheeses, chicken wings, pork chops, hot and cold food to-go, ice cream, pastries, salads, sandwiches, and the like. A Chef’s Counter will boast a six-seat, reservation only, high-end 14-course fresh organic vegetable dinner. The Commissary is a large-scale kitchen that will prepare ingredients for an array of sandwich shops throughout New York City. DeRossi is onto big things. People around the world are reaching out to praise his commitment to plant-based living, food, and business, which he finds extraordinarily encouraging. Sustainability and health consciousness play into his decisions, but ultimately, a deep love of animals drives the entrepreneur. DeRossi even started a non-profit, BEAST (Benefits to End Animal Suffering Today) to end cruelty towards all animals through fundraising and awareness-raising events for like-minded organizations.